Happiness is… When all things come together. What an amazing day I had yesterday. The sun was up and shining brightly with nary a cloud in the sky and the temperature was a balmy 16 degrees on my back deck before 7am. It was shaping up to be the perfect day for me to sit in my girly gazebo and make some headway on my manuscript. The gazebo is my favorite place to work – the sun warming my skin, the fresh air, the birds singing. Unfortunately, the climate I live in only allows me to do that for a few months of the year, and then only on the days that are not rainy. First thing in the morning I downloaded a writing program, imported my WIP file and set it all up before I even started to write so I wasn’t expecting to grow my word count by many words. I’d used the writing program before on my PC and loved it. When I bought my Mac, I downloaded the version for it, or so I thought. I tried using it a few times but it didn’t seem to work very well. I contacted the developer, but because I didn’t buy it through them, but another broker, there was little they could do for me, but being the great company they are they tried to give me some pointers unfortunately nothing seemed to work. I was frustrated and a little angry that I’d purchased something that didn’t work, so I put it aside. I went back to using word, but it just wasn’t working for me. I’m not a linear writer so I was finding it really frustrating to search through my word document trying to find the place to add in the scene I wanted to write at the moment or cutting and pasting parts here and there later on. So much so I was not very productive the first 6 months of this year. Yesterday I decided enough was enough and deleted the version of the writing program I had and download the “real” version directly from the developer’s web site (where I purchased the PC version), something I should have done months ago. Early in the morning I was a little overwhelmed with what I perceived would be a lot of work to get my WIP imported and set up into chapters and scenes, I’m not techy at all, but truly it wasn’t that bad and I’m so glad I did. I must have been truly inspired because I even shocked myself when I looked at my word count at 4:30 pm and it had rose by 6000 words. Finding and using tools that help you write the way that is most productive for you is like winning the lottery. Time flies by and word count grows before you even realize it. It takes all the worries and frustrations out the equation so that the creative juice can flow like a fountain and brings the fun back into writing. 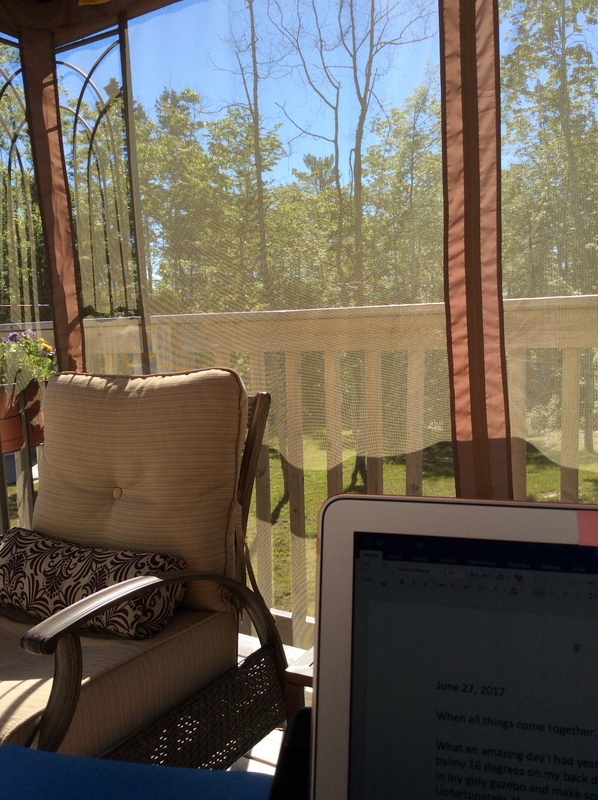 When all things come together: Sun, gazebo, fresh air and a writing program that works it’s the perfect combination for a highly productive and inspiring day. This morning will be another day like yesterday. Already 31 degrees Celsius by 10:00am on the back deck. I’ve set up in the gazebo for another productive day.